If you are approved for WIOA funding, please contact our office at 256-306-2515 to complete your registration. Interested in a personal student loan from Sallie Mae? Note: Students must be certified/authorized for Sallie Mae loans at least 30 days prior to the class start date. The 50-hour EKG Technician Certification Program prepares students to function as EKG Technicians. 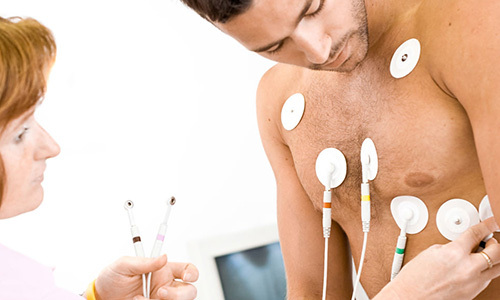 This course will include important practice and background information on anatomy and physiology, medical disease processes, medical terminology, medical ethics, legal aspects of patient contact, electrocardiography and stress testing. Additionally, students will practice with EKG equipment and perform hands-on labs including introduction to the function and proper use of the EKG machine, the normal anatomy of the chest wall for proper lead placement, 12-lead placement and other clinical practices. Note: Upon successful completion of the program, students may sit for the ASPT– Electrocardiograph (EKG) Technician exam and other National Certification Exams. Times: 6:00 p.m. – 9:30 p.m. Program Fee does not include cost of ASPT EKG Technician Certification Exam – $90. ASPT National Certification Exam is available at Calhoun Community College. *Education Requirements: Students must have a High School diploma or equivalent. Click Here for the Online EKG Technician Program. All refund requests for the Summer 2019 classes must be received in writing by the close of business on May 24, 2019. Email diane.peck@calhoun.edu with your request, and then call 256-306-2515 to confirm receipt of the request. Calhoun Community College is not responsible for emails that are not delivered/received.